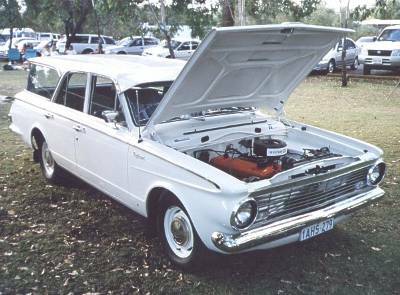 On May 30 1963, Chrysler Australia produced the first Australian manufactured Valiant (as opposed to the 'assembled' R&S Series) - which was known as the AP5. Late the year before, Chrysler Australia had begun work on the new $36 million Tonsley Park facility in South Australia, where it could boost annual production to 50,000 cars. The AP5 ("AP" represented Australian Production) was an entirely new design sharing six body panels with its US cousin, although the Slant 6 driveline was retained from the previous R & S models. Gone were the 'winged' front panels and larger grille of the previous model, which made way for a more subdued and simple flat grille treatment. The rear of the car also lost the horizontal finned rear quarter panels of the previous model, in favour of a uniformly curved bootlid and rear quarter panel setup. With high local content and a design adapted for local conditions, this 'AP5' Valiant strengthened the brand's position in the marketplace and in November 1963 an AP5 station wagon, or "Safari" was offered. A "Regal" version was also introduced to the range as a more luxurious variant. The base model was released with a price of 1220 pounds, 35 pounds cheaper than the previous 'S' series. There were 49,400 AP5's made.